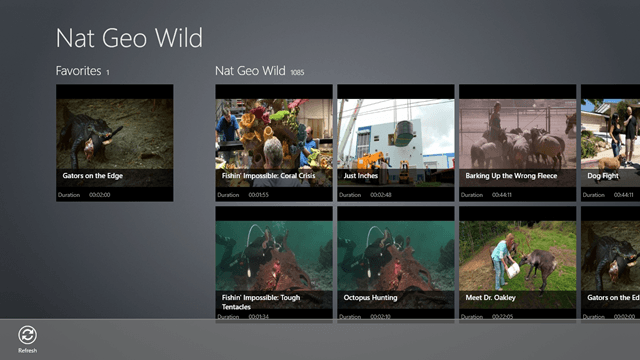 Nat Geo Wild is a free Windows 8 and Windows 8.1 app that allows you to watch videos from the National Geographic Network. The aim of the app is kept as simple as possible – it just fetches videos and allows you to play them through the video tiles in the main screen of the app. The videos are technically YouTube videos, which can be played back in the app itself; however, this means that you need to have a working internet connection to watch these videos. You can also favorite a video through the control bar by launching the control bar in the video playback screen (right clicking), and selecting the Favorite option. Favorited videos will then appear under the Favorites pane in the main screen of the app. 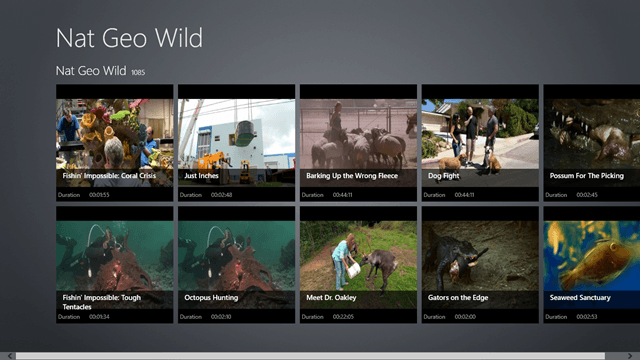 Nat Geo Wild is available as a free download from the Windows App Store. When you launch the Nat Geo Wild app after installing it on your device, you will be presented with the following interface. 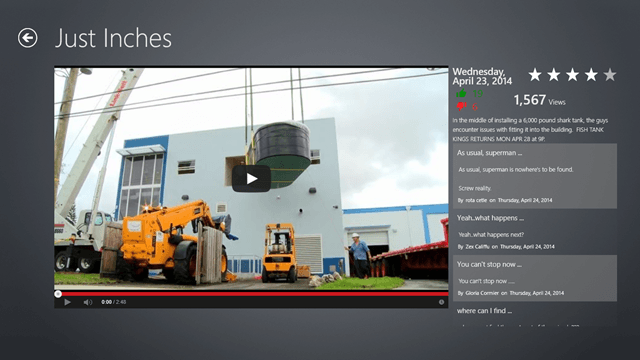 As you can see in the above window, you will be presented with the thumbnails of the videos that you can choose to play back. These videos are presented in the form of a scrollable grid of picture accompanied tiles that also have text caption on them, so that you can easily know what you are choosing to view before you even click on a video. Once a tile has been clicked, you will be presented with a screen which looks like the below screenshot. As can be seen clearly in the above screenshot, the video is actually a YouTube video, but the good part here is that this can be played back inside the app itself, because the app has Flash Player support. You can play the video by clicking on the Play button at the centre of the video preview, and you can also go through the comments on that video by glancing at the right side of the screen. To favorite a video, you can launch the control bar by right clicking on any empty area inside the video playback screen (showcased in the screenshot), and click on Favorite (the only button) in the control bar. Upon doing so, the favorited video will appear on the app’s screen. The main screen of the app can be accessed easily by clicking on the back arrow button in the top left corner of the app. In the screenshot above, you can see the Favorite button in the control bar. When I click this button, upon returning to the main screen, I can view my favorited video with ease. Let’s see how this works by returning to the main screen of the app. As you can see above, I can see the video that I just favorited under the Favorites section, on the main sreen. You can also see the control bar of the main screen in the above screenshot. This bar has just one control – to refresh the feed of videos. Bringing up this control bar also has the same procedure of right clicking on any empty space. To Unfavorite a video, just return to the video playback screen of the video that you have favorited, launch the control bar, and select Unfavorite – simple! Basically contains YouTube videos, so does not take up a lot of space on your system by storing videos. Ability to favorite and unfavorite videos with ease. Contains only YouTube videos and no other helpful content like articles, etc. No option to comment on the video, only allows you to read the comments posted on videos by other users. 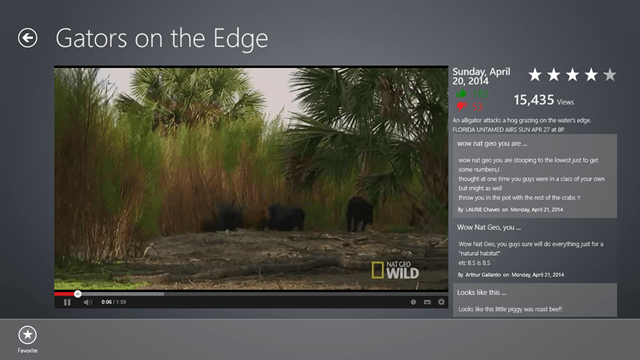 Nat Geo Wild is a great app to learn more about the animal kingdom as it fetches videos from the Nat Geo Network. Although the app certainly have its fair share of quirks and qualms, it is still a great app because of its light weight, and amazing collection of videos. I certainly recommend this app! I rate this app a 3.5 out of 5.